Valentine’s Day is only a few days away but there’s still time to find an I-love-you gift. Art Under the Arches is taking part in Love-filled Gifts this week. One of the Gallery’s featured artists is Tracy Taft. 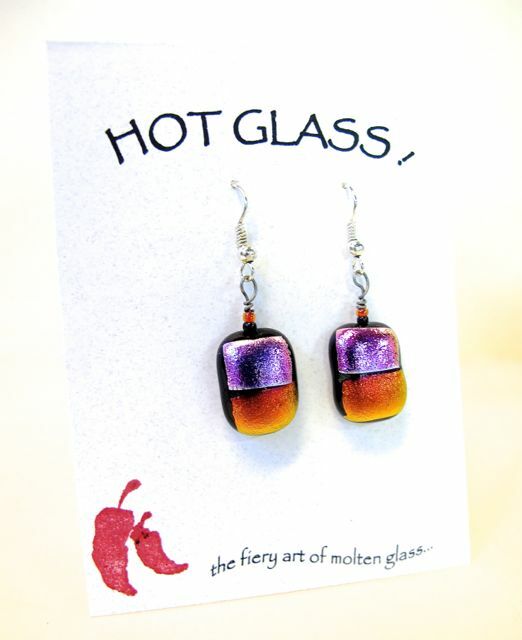 Buy a pair of her fused glass earrings —you’ll get one dollar off the price and a gift box for your purchase. You’ll find other Love-filled Gifts at aVita boutique, Sue’s Flowers and the Copper News. Claire Bistline and Terry Gonzales — two well-known Ajo artists — are having a joint show of new work at aVita boutique. The opening reception is Saturday January 16, from 4 to 7 pm. Everyone is invited! A special treat awaits you this Saturday in Ajo. 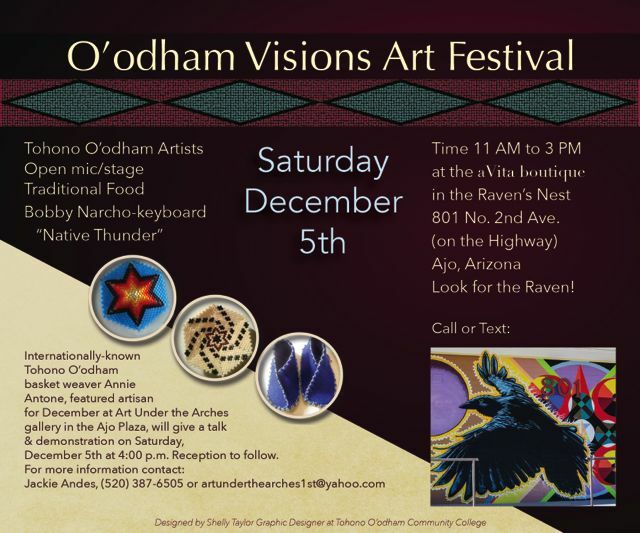 Jovita Wallace, owner of aVita boutique, is hosting the first O’odham Visions Art Festival at her shop in the Raven’s Nest. The event features several O’odham artists, including local musician and composer Bobby Narcho. This event runs from 11 to 3, Saturday December 5. 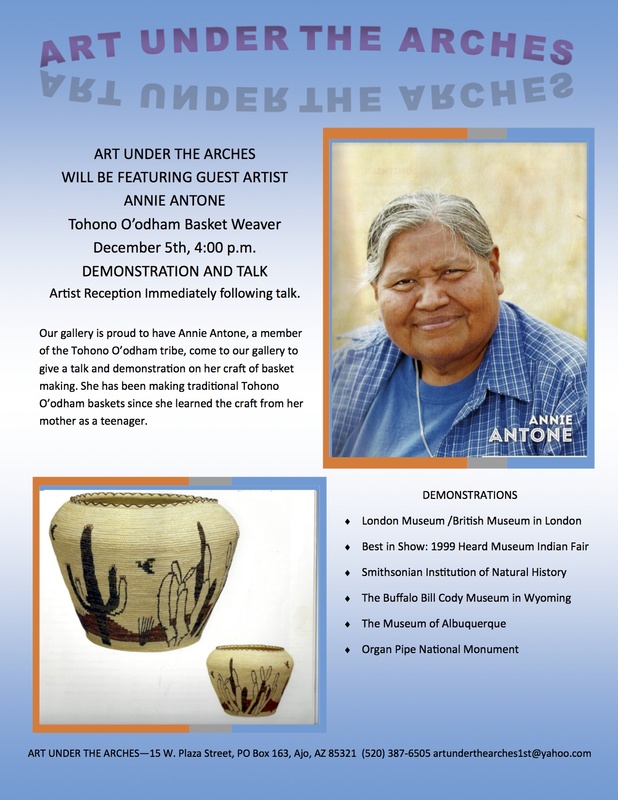 Later the same day at 4 pm you can hear a talk by Annie Antone at Art Under the Arches Gallery in the Plaza. She’ll also do a demonstration of the basket weaving that has won her wide acclaim and numerous awards. There will be a reception after Annie’s presentation. 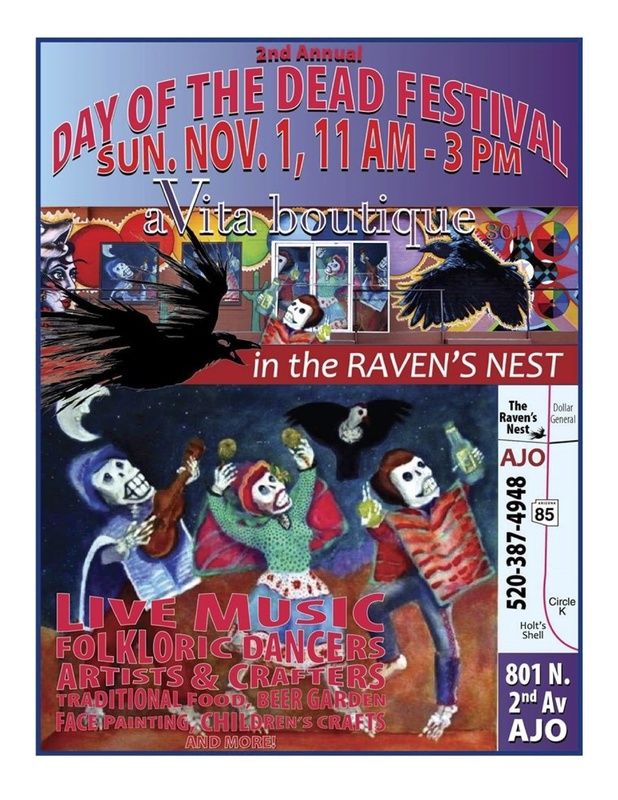 Ajo’s 2nd Annual Day of the Dead Arts Festival will be held Sunday, November 1 from 11 a.m. to 3 p.m. at aVita boutique and the Chu Chu Club. Dia de los Muertos ritual symbolism such as Pan de Muertos bread. Ajo art teacher Allison Venturella have children creating paper streamers and decorative Guatemalan kites. An Ofrenda will be constructed (we are hoping ACFA members will create this) for an interactive experience. We need an artist to create a skeleton to perch on the top of the Ofrenda (which can be sold/raffled off). We need you and hope you can support the arts festival by being a vendor or volunteer. There is a $25 vendor fee for participating artists and crafters. Contact Jovita Wallace if you’d like to join us!